This journal is a platform for publishing innovative research and overviews for mechanical engineering and advanced material. The journal reports the science and engineering of advanced materials in the following aspects publishes theoretical and practice oriented papers, dealing with problems of modern technology (power and process engineering, structural and machine design, production engineering mechanism and materials, etc.) It considers activities such as: design, construction, operation, environmental protection, etc. in the field of mechanical engineering and other related branches. 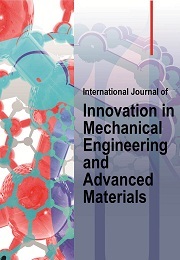 In addition, the journal also published in advanced material related with advanced electronic materials, advanced energy materials, advanced engineering materials, advanced functional materials, advanced materials interfaces, advanced optical materials, advanced science, particle & particle systems characterization, small. Novel and cutting-edge results warranting rapid communication. The journal also publishes special issues on selected topics and overviews by invitation only.